I just wanted to take a minute to say enjoy your holiday and really think about all that you are thankful for. God has blessed me and my family beyond my imagination including giving me many of you as friends! I hope your Thanksgiving is wonderful! I don't think I have posted this card. We made this one at the last workshop. The swoshes are stamped with versamark and embossed with white embossing powder. This gives a good white color for the background. I used the brayer to roll Chocolate chip ink over the embossing and then wiped off the excess ink. The card is made with Chocolate Chip, Baja Breeze, and glossy white card stock. 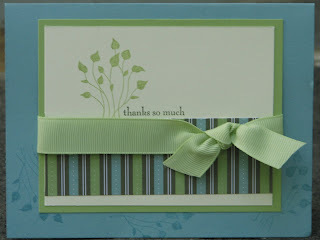 Stamping guru, Jennifer M., suggested the leaf half ink stamped on the Thinking of You- It added the perfect touch! This is the cutest card and I cannot figure out how to turn it around! I got the idea from the SU publication. It uses the scallop punch shape folded into the turkey feather shape! All the parts are punched out. I thought he was the cutest thing- wouldn't he be a great place card at you Thanksgiving table? Don't get a crick in your neck! I really like this card! It is made of Kraft paper, Basic Black, Very Vanilla, and a Decorative paper SU put out a while back. It was the best paper (red and vanilla) and I would love more! The ribbon and Spare Parts brad (from the Lobby) make this simple, any occasion card complete. Please ignore the fact that no matter how hard I tried, I could not get any of the pieces of paper to go on straight! I don't usually have that problem, but today I just had to give up! These are cards we made in September for my workshop. This card uses the note card from the Carousel Notes. I plan on posting new cards all week, so keep checking back. I am so excited to participate in the color challenge . The colors are really nice and playful, so I had a fun time putting all the colors on the card with some fun shapes. I ordered a SU die to see if I could get it to work in the Cuttlebug. After a few tries and a broken plate, I got it to cut! First, I fed the paper thru the sticker maker, then thru the Cuttlebug, and it made the perfect addition to the card! The picture isn't the greatest- it was getting dark when I took the picture. 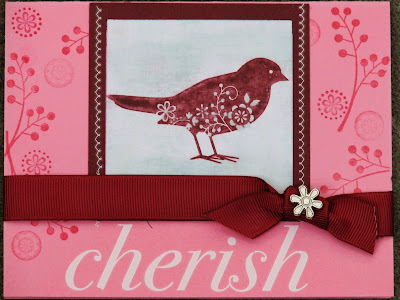 I like this card- it is simple and shiny, and appropriate for any situation. Sorry for the long time without a post. It has been really crazy around here with the house and the boys. We travel next week, and then I will be back to stamping. I found a really fun thing to do! I am taking old cards that I made and never did anything with , sprucing them up, and selling them in the Holiday Bazaar! Here is the first before and after. The colors are still kind of harsh, but you never know who might love this card! Do you? 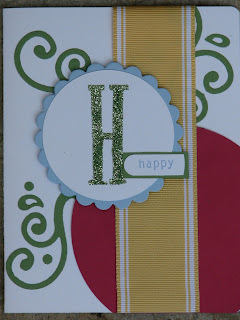 I am working on cards for my end of the month workshop and to sell in an upcoming craft bazaar. I came up with this one last night and totally love it! 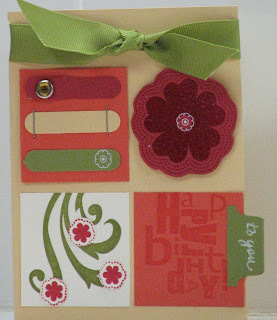 The design is a copy of Angela Jones I found on Splitcoast stampers. Then I mixed up the colors with Baja Breeze, Certainly Celery, Almost Artichoke, Very Vanilla, and discontinued SU paper- The card is very soft and restful looking. Even though I tried to alter the photo, I don't think the pic gives you the soft feel of the colors. My boys are camping this week end, so my plans are to stamp all day! Keep checking back for more ideas! 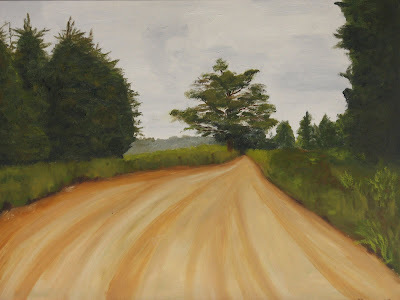 I have missed blogging, but have been so busy working on house stuff and trying to get the boys moving in the right direction. I thought I would be so glad to have them back in school so I could get back to a routine ( can you say OCD? ), but I have yet to get a routine that works. I am doing a craft fair in October so I plan on having several really cute cards to sell! Keep looking! 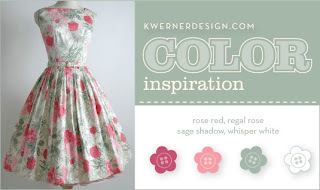 Color Challenge #20 is to use Chocolate chip,Regal Rose, Pink pirouette, Certainly Celery, and Very Vanilla. I just got this stamp set yesterday, and love it! Those little owls just make me laugh! I tried to glitter up the little pink owl, but she lost her cuteness so I just gave her a diamond hat! I am painting again. Here is the first of many to come. I got carried away with the challenge this time, but I have had so much fun stamping this morning. 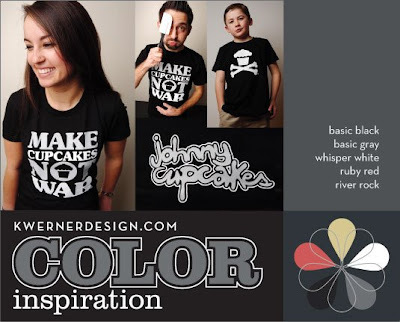 These are my new fav colors- I could do my whole new house in black, white and green and be so pleased. I cannot get enough of my Justrite monogram! Sorry for the redundancy! And just for a giggle- I changed my mind in the middle of the card- turned it over, and then went back to my original backgound! No sense in wasting paper! I can cut it in half and attach it to new card stock. Once my ideas get flowing I have to take advantage of it or I will forget what I was doing! I really love the colors in this inspiration. 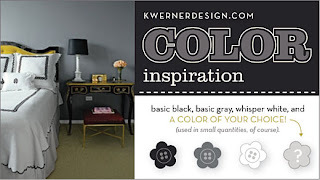 Try it along with me- post comments with a link to your project, or join the fun at www.kwenerdesign.com. Check back for my cards. 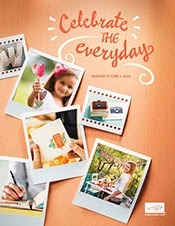 I have been eyeing the monogram stuff for a long time, so you can imagine my excitement when I saw this Justrite stamp with interchangeable letters. I have had it one day and look what cute things I can make! I am so thrilled to have this and am already dreaming Christmas gifts! My friend Melissa had a sweet baby boy yesterday. I stamped this card for her. I love the Just Celebrate set. The card stock is Baja Breeze, Real Red, Barely Banana, and Confetti White. Here are some pics of the cards we are making at my workshop tonight. I wanted to use as many new supplies that I had, and I loved the color 'schemes' in the catty. This one is Eastern Eclectic. I want to say that there is a good chance that these cards were direct copies of a card I saw somewhere. I feel sure the eclectic and bella are my original designs, but the other I put together so long ago (probably last week! )that I am not sure where I got the inspiration. If it is your card, please let me know and I will give credit where credit is due! After Becky http://www.nawlinslady.blogspot.com/ was so sweet to give me this awesome award, I completely stopped stamping! Then I felt guilty, and stamped a little something crazy today. I was visiting Splitcoaststampers, and noticed the heading on the page was with teal and brown. Just for fun I pulled Taken with Teal and Choco chip. I think the card look great! I used Doodle This stamp set, Taken with Teal, Chocolate Chip, and Kraft paper. I added a little organdy ribbon and a fancy brad! I hope no one is offended when I don't pass on the award. The truth of the matter is I don't look at that many other blogs. I am busy building a house, shuffling boys around, and stamping as much as possible. The few blogs that I frequent are listed already! I am so computer illiterate, that when I do adventure out on the web, I usually get lost! I appreciate the kudos, and I love the comments left on my blog- the whole world wide blog thing blows me away-(someone left a comment in French!) Please continue to visit. I couldn't stand it. The more I looked at the first card I made for the CI, the more I didn't like it! In the middle of the night I was fretting over that card. The background of the original card was so pretty that I literally ripped it apart and reused it. I like the new version, but it is way different than the cards that I usually make. Thank you to Sonic and Becky for the sweet comments- I hope you like this one too. Here is my interpretation of the color inspiration. I like the colors together so much I am working on another card for the August workshop! The Roses in Winter are stamped with Rose Red and Regal Red. Sage Shadow is used for the leaves. I painted the chipboard letter with the Sage Shadow marker then painted over with white paint. It is a slight tint of the sage. The polka dots are stamped with a pencil eraser. 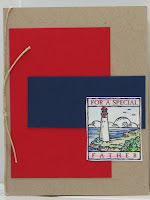 I punched the sage paper with the new scallop punch that will be in the new catalog! This card is way girly than I am use to, so I tried to go shabby chic. I am not quite sure I got what I wanted. Kristin posted this color inspiration. Pretty colors on the dress, but not may favorite to stamp with! I don't even own a Sage Shadow ink pad! Kristen put out a color inspiration using Chocolate Chip, Close to Cocoa, Really Rust, Certainly Celery, and Whisper White. I love painting that pear, so here I am with those colors on fruit (again)! We had a great time at the lake this weekend. My parents and brother and sister- in- law joined us for water fun galore. My family is trying to bring water skiing back to the lake. I must say my oldest son will make quite a few kids take note when he is cutting the rug behind the boat. The dogs swam and we ate as much as possible! It was a great time. I will probably take a break from stamping to get my house stuff in order. The framers are really moving along and I am starting to feel behind. These are really funky colors- but I like the results. I got a foam stamp in a kit from the local stamping store, and I love to use it. Here it is more like wallpaper. I even stamped the back of the card! The River Rock looks great with the Basic Gray and Black. Any color of red or pink adds the pop the card needs. We are off to the lake for the holiday weekend. I hope everyone has a safe and fun 4th! 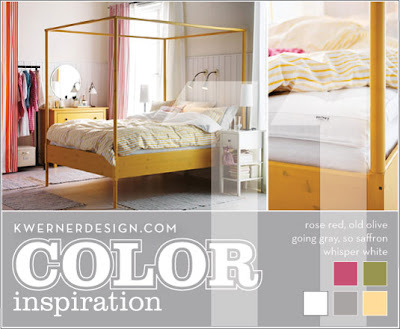 Here is the new color inspiration. I am going to try to play despite the quick deadline because these are my favorite colors to create with! Watch out top 10! My entry to the CI #13 came completely from my scrap box! I am posting my own inspiration. As primitive as it is... (my sweet husband won't fix the scanner). 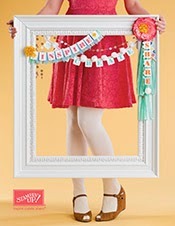 I saw this ad about the same day that I saw a cherry card on the SU web site. I totally copied one card and then adapted the other to look more like the ad. I apologize for not giving credit to the talented artist who came up with the idea. The funny thing is that it took me two days to track down a punch to punch the cherries! Thanks to Frances for lending me her punch! A sneak peak into my workshop cards this week. 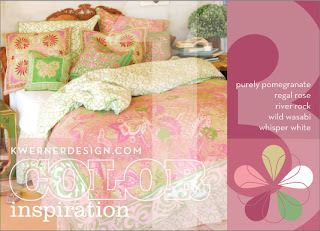 I have had so much fun with the color inspirations at www.Kwernerdesign.com that I decided to keep the flow going. The feel of these cards reminds me of a summer dress that one would wear to church on Sunday. I tried to keep them light and girly! I found the best inspiration for a card and then cased an idea from SU showcase. In my mind the card is so cute! I was so excited to post- but I cannot find a 1/2" punch which I need to compete the card. I hope to have it and other cards on later today. I spent all day yesterday working on ideas for my workshop this week. The theme is cool, white, summer cards. Some are already posted on this blog, and some I just changed up a little. One more attempt at the Top 10 of Kristin,s picks. I am really into white cards right now. They remind me of Easter dresses. This on is so simple with scallops and circles. We are off to the lake for the weekend- no stamping, but I bought 4 magazines to read! 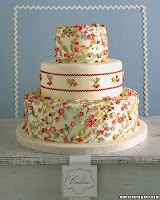 The Be Inspired Challenge #18 from fresh & fun was from this Martha Stewart cake. I found this challenge from Beate a real challenge. The cake inspiration was so pretty, and I wanted to convey the same soft flowers on a card. I like the results- even though it was so hard to get a good picture. I felt so creative yesterday that I actually did two challenges! This on is a pattern beate put on her blog- and on Splitcoaststampers.com. I am always looking for new ways to tie ribbon. A bowline wouldn't work, so I went with the knot tied like a tie. Hopefully this is the only tie our Daddy will be getting for Father's day! 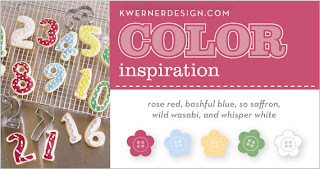 Join the color challenge from kristin over at kwernerdesign.com. I really like the light feeling of these colors- and I am thinking about that big flower stamp set- check back to see what I came up with. Here is the next installment of Blair's black eye! Not as impressive as I thought it would be. A week later you cannot even see it unless he holds his eyelid down. He was very blessed - it seems his injuries were mild. The protection prayer I pray every morning works! actually we were at Family Fun night at the baseball park. The coaches were playing a rousing came of softball (with lots of coaching from the parents) and some kids were playing a Homerun derby on the other field. It seems that my hubby was watching this homerun derby and talking to other parents about how the Chenault family is always hurt in some interesting way. Right now my 11year old is in the last week of the cast he is wearing for a fractured hand. Anywhoo, as the dust settled on the pitchers mound' who was lying in fetal position moaning in pain? Of course, the other Chenault boy...Blair took a ball to the face smacked off the end of a bat! After a rather non eventful 3 hour visit to Womens and Childrens, we learned that Blair fractured the orbital floor, and his nose. He has a real nice shiner and if you look carefully you can see the print of the ball on his cheek. The moral of the story... Bubble wrap may be a good idea! 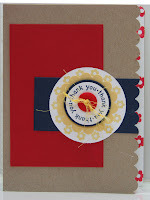 I was in a jam looking for ideas to do at my monthly workshop when I spotted this card in the Stampin' Success. I changed it a little to fit what I had and wanted to use at the workshop. I really like the results! The colors are Bravo Burgundy, Soft Sky, Kraft, and Old Olive. I stamped with Choco Chip ink. I am getting my scrapbook stuff out tomorrow if it kills me- which it might. I am hoping to get the boys to help get me started again.